Afternoon Loverlies! I have received another book from Baker Publishing for review. 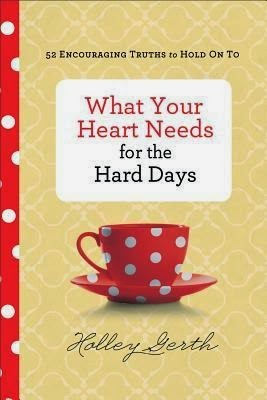 This book is What Your Heart Needs For The Hard Days by Holley Gerth. I LOVE the cover on this book, it has a cute red teacup with white polka dots on it. I also love how little devotional books are made. They usually have a suede cover or like this one, it has a type of padded cover. I just love how books feel to the touch. (Yes I am weird, I know.) I enjoy reading this little book because, I find it would be perfect for little bible studies every morning. There are 52 chapters in this book and at the end of each chapter is a prayer you can pray. What is interesting about these little prayers, at the end of them there are lines where you can add onto the prayer. After the prayer there is a scripture you can read in your bible going over what the chapter talked about. Gerth wrote these devotionals a little bit different then the other devotional books I have read in the past. She has written little stories that go with each chapter. It makes it easy to understand what I am supposed to be getting out of the scripture that is for that specific chapter. I find this book to be perfect to leave out on your coffee table or your bedside table to read daily. Have A Blessed Day! In this uplifting book, Holley Gerth invites readers to sit down with her to be filled with the strength, peace, and joy that come from God's promises to us. Each of the 52 devotions based on the Psalms will help weary women remember that God is good and we're all in this together. Whether it's a bad hair day or a broken heart, Holley offers hope and encouragement to get us through whatever life brings. Women need that kind of encouragement because we all have hard days--days that make us want to give up, retreat inside ourselves, and drown our sorrows in a pint of ice cream. And while we may crave all sorts of things to ease the pain we feel in our hearts, what we really need is truth. We need to be confident in God's character and his promises. We need to remember--and celebrate--who he made us to be. And we need exactly the kind of encouragement Holley Gerth loves to offer. Too cute. Love the teacup! :) Yay!